The Royal Mint has warned people who might consider melting down 1p and 2p copper coins to think again. With copper prices topping $9,000 a tonne, pre-1992 copper coinage is now worth twice its face value - although newer ones are copper-plated steel. The Mint, the UK's official issuer of coinage, said it was illegal to tamper with UK currency. 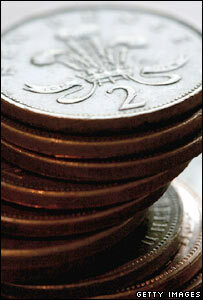 The Mint declined to say how many of the UK's 6.3 billion 2p coins dated from before 1992. Rapid economic growth in countries such as India and China has led to a boom in the value of a wide range of commodities, from copper and platinum to oil and gas. The demand for copper, especially from the building trade, comes thanks to its role as one of the best electrical conductors in the world. In the developing world, the result is that the theft of telephone lines - long a problem for telecoms carriers - is now worse than ever, although copper producers such as Chile and Zambia are making money from their mining operations. In the UK, however, the Mint said that melting down its currency was not only illegal - but impractical. "Even if it were legal, the practicalities involved in melting down such huge quantities of coins would seem to us to make it a highly improbable task for the average consumer," it said in a statement.